We had very good luck this year on Everest; even we have deled one day flight to Lukla. There was not flight before few days but we got first and last flight to Lukla on 10th June. Our couple was very exciting to reaching Lukla. 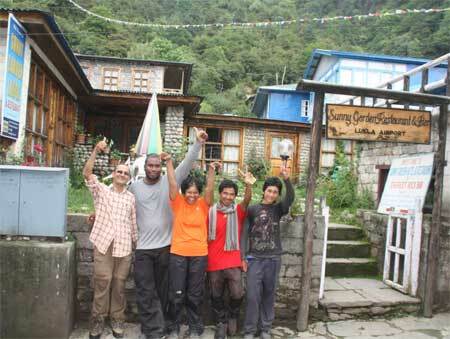 Trinidad & Tobago couple’s Team deployed by Asian Hiking Team to exploration of Everest Base Camp in Khumbu valley returned Kathmandu on June 20, 2012. To begin the trip, we flew up to Lukla and then made a slow and careful trek through the beautiful forested and terraced Khumbu Valley. One day rest in Namche Bazaar, than continues up to Tyangboche. We have short participant in worship programs in Tyangboche Monastery. All hotels were closed because of summer season so we decided to stay in Debuche. Original plan to stay two nights in Dingboche for acclimatization but we have very tried time so heading up to Lobuche. Beautiful day so we catch Mt. Everest, Mt. Makalu, Mt. Lhotse and many others peak on this day. Upon reaching Everest base camp we rested and enjoyed some picture over the glaciers around base camp. Ian Son Lee, the handsome & very fat, tall man, said it was my dream in this trip so it’s in real life today to running Base Camp and adding: “thanks for the patience + hospitability. Nepal will always be remembered”. Similarly, Mauree said, “Was worth every minute. Thanks for the pain and cheating during “dhumbal”. Plenty of time so playing Nepali game “Dhumble” during our trek. It is very few trekkers in Nepal from Trinidad & Tobago, is lying just off the coast of northeastern Venezuela and south of Grenada in the Lesser Antilles. It shares maritime boundaries with other nations including Barbados to the northeast, Guyana to the southeast, and Venezuela to the south and west. The country covers an area 5,128 square kilometers (1,980 sq mi). The travel arm of Malaysia Airlines, is offering attractive holiday packages to in conjunction with the launch of its thrice weekly B737-800 services between and the capital effective 1 September 2012. Customers have a choice of full board package with tours to various tourist and spiritual sites or the Free and Easy package for the more adventurous ones. These MAS holidays packages can be customized also for two persons or group departures. For the inaugural flight on 1 September 2012 from, MAS holidays is offering an exclusive and irresistible 4 days 3 nights holiday package including a day tour of the three fabled cities of , Patan and Bhaktapur. Tourists will also get to cherish the breathtaking view of the green terraced hills and embrace the country’s rich culture, art and tradition. Malaysia Airlines Senior Vice President Global Sales, Duncan Bureau said, “MAS holidays is delighted to offer this exclusive holiday package to commemorate its inaugural flight to the capital city of. Customers will be able to enjoy affordable land tours from as low as RM3030 for share twin, inclusive of 3 nights accommodation in a 4 star hotel, daily breakfast, transportation, local English speaking guide, arrival and departure transfers and monument entrance fees”. “Kathmandu is a travelers’ haven and also the transit point to major tourist destinations in. Home to seven UNESCO World Heritage Sites in, one will have plenty to see and do during their stay,” he added. The inaugural flight holiday package also covers visits to sacred sites like the, and , as well as famous locations like the in. In addition, there is also an optional trip to the Tibetan Refugee Camp and the where customers can witness hand weaving of beautiful Tibetan carpets and mounding of metal statues. Promotion period for this package starts now until 15 August 2012 for travel on 1 September 2012 only.